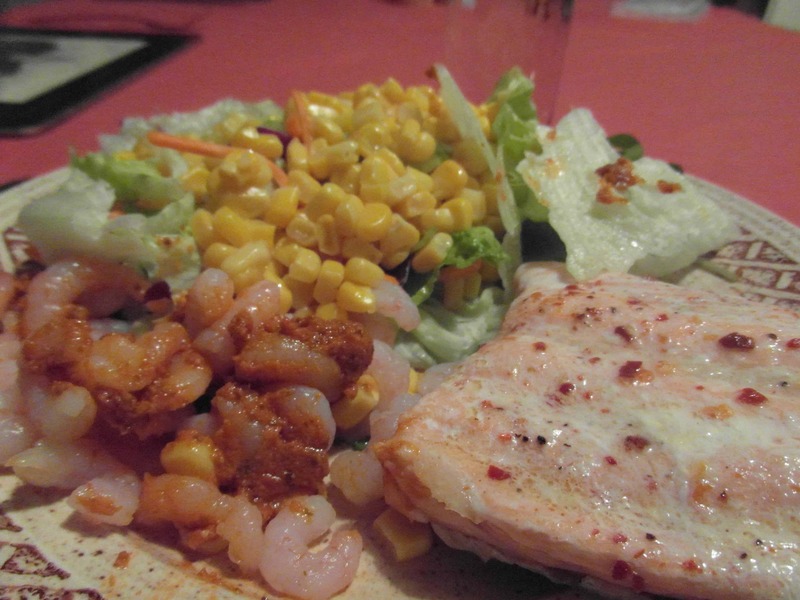 Last weekend I decided this as it – I had to get things right this week and get on top of my eating and training. A fellow blogger, Eating Like A Horse, has been running a campaign by MoneySupermarket.com to ‘get fit and feel epic‘ – and it’s spurred me on to really set some goals for myself. I’ve realised one of my problems is in the evenings I’m too tired to bother cooking decent meals or preparing lunch for the next day, so I end up slacking or missing meals. But not last Sunday, oh no, because last Sunday I made this…..
Oh yes, it was a gluten free healthy cooking extravaganza of EPIC proportions! 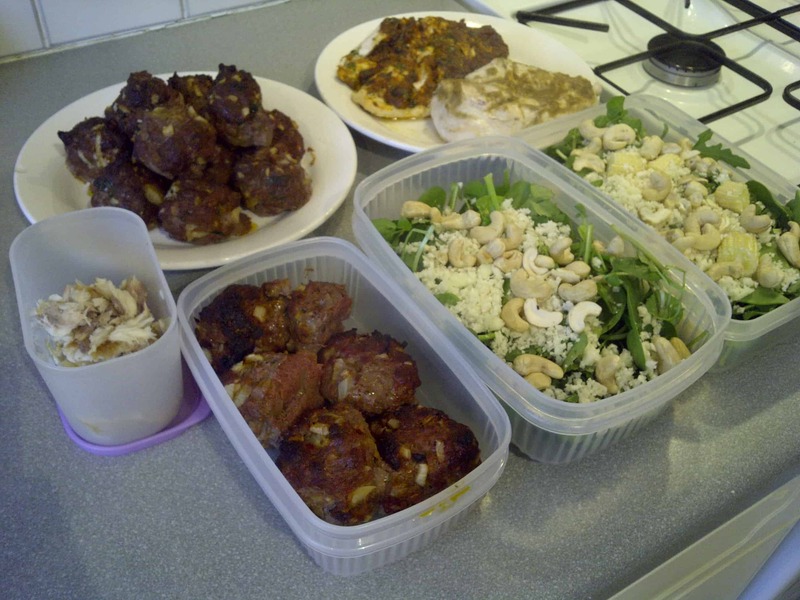 I prepped two varieties of beef meatballs (recipes here), smoked mackeral for my breakfast and some marinated chicken. I made up two salads for the next two days (didn’t really want to make salad much more in advance than that so it didn’t go off! ), portioned off the meat and then froze the rest in portions to defrost the night before! Prepping a week’s worth of meals has taken so much stress off the rest of my week – and I’ve even had time to hit three of PT Steve’s high intensity classes, so am feeling good! To help give those of you an idea of what I am eating during the day, here’a rough breakdown of a typical day. I’ve been trying really hard to think of healthy snacks which give me a boost of protein and fat. Smoothies have been a great option for me (see my berry and avocado smoothie recipe here) but I’m not much of a sweet-toothed person so I was craving something savoury. 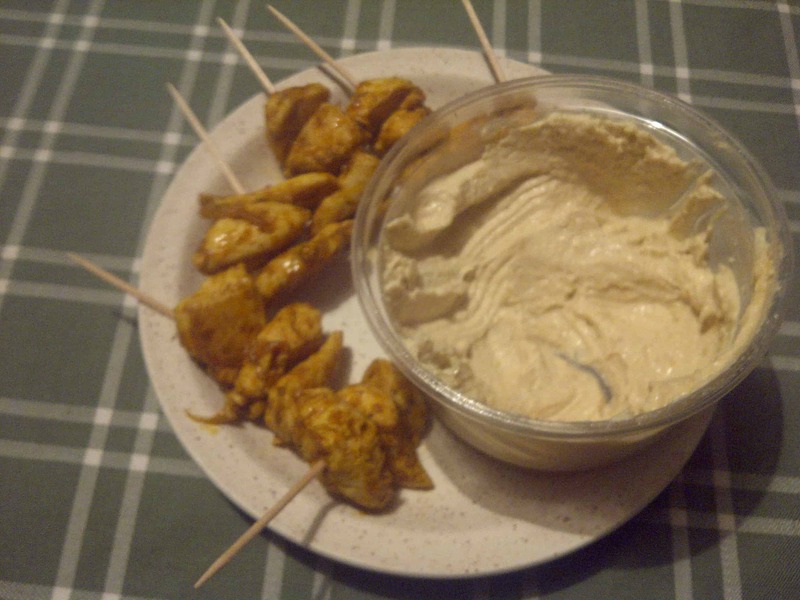 Houmous has been a great snack for me – I rolled babycorn in ham and then dipped it in houmous – delicious! All-in-all, I think I’ve actually done pretty well with my eating and training next week, but until I get into the shape I want, I need to keep setting new goals. So, with all my meat cooked up ready for the week ahead, it’s time to set some new goals. Reduce the amount of coffee I drink – Ideally, I want to be down to just one or two cups a day. But when times get bad and I get stressed, coffee somes as second nature to me. I need to drink more green tea and cut down the coffee, as last time I did it I felt pretty epic. More weight training – The classes have been great fun but I really want to burn fat and get stronger, so it’s time to get on the weights! I think it’s time fo the weight in now, let’s hope all this healthy eating has done some good, and I’ll keep you abreast of my goals next week! How is your healthy eating going? Are you still keeping up your resolutions?